In the early 1930's, the State of Tennessee started a state-wide police force called the Tennessee Highway Patrol. 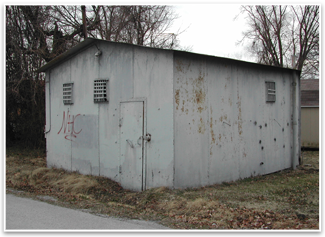 In 1936, a Tennessee Highway Patrol Sub-Station was built in Rockwood, Tennessee, facing Kingston Avenue, which in the 1930's, was part of the Dixie Highway. When this Station was originally built, the State Trooper's mode of transportation was a motorcycle. As automobile traffic increased, wider, non-residential, roads were needed and U.S. Highways 27 & 70 were moved to the newly created Gateway Avenue to relieve traffic congestion on Kingston Avenue. In 1954, a second Patrol Station was built facing the new Highway 27, and the 1936 building was used for storage and then abandoned. In an effort to save this unique historic structure, Rockwood 2000 began researching its history and preparing to restore it. As part of the restoration process, the building was nominated to The National Register of Historic Places and was awarded that historic status in 2001. In 2003 the restoration was actually begun. 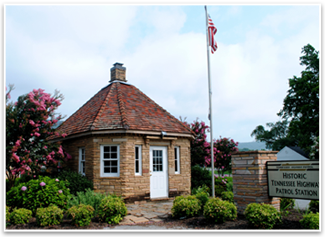 The 1936 Patrol Station is now a museum dedicated to the men and women of The Tennessee Highway Patrol. The video presented here is of the dedication ceremony. Anyone wishing to tour the museum may do so by appointment only. Please visit our Contact page. In 1954, after the creation of Gateway Avenue, a second Highway Patrol Station was built facing the new highway. This second building was built similar to the 1936 Sub-Station, but in a more modern style without the decorative ornamentation. Its size reflects the expansion of the Highway Patrol workforce, and their increased responsibilities and duties. This second Patrol Station was in continuous use from 1954 until 2006. After seventy years of use, the Highway Patrol had outgrown the facility and chose to relocate to a strip mall in north Rockwood that had been converted into governmental office space. 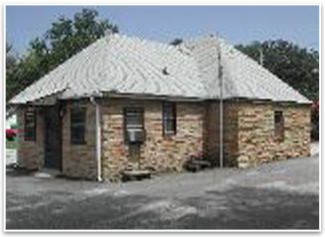 In 2009, the City of Rockwood provided this building to Rockwood 2000 for its use as a meeting place and to house historic files and other materials used by the organization in their projects. In 2011, Rockwood 2000 was successful in having this second Highway Patrol Station placed on the National Register of Historic Places. Rockwood 2000 is currently exploring grant possibilities to restore the building. The building was named the Wassom Building after Judy and Stanley Wassom, long time supporters of Rockwood. The Old Calaboose is Rockwood's old city jail. Originally built in the early 1890's, it was a wooden structure and succumbed to fire sometime between 1908 and 1913. By 1913, it had been replaced with the present structure which is constructed out of bricks and covered in sheet iron. 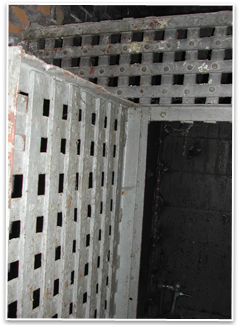 With three cells, it held all of Rockwood's problems up until sometime in the late 1950's when a new jail was built. Unfortunately it seems that part of the 'decommissioning' process involved a cutting torch on parts of the cells and restoration of this damage could prove quite expensive. It is, however, a part of Rockwood's history that is at least 100 years old and probably worthy of saving. © Copyright 2011 Rockwood 2000. All Rights Reserved.